The Wind Arrives In Sooke | What The Sooke? Last night, as I was lying in bed, the wind came up and buffeted the coast all night. It’s a sure sign that fall is upon us and winter is on the way. Having always lived in coastal areas, I thought I knew what wind storms were all about. Since moving to Sooke 3 and a half years ago from the mainland, I’ve come to realize how much the mainland is protected from the Pacific storms that rock the Island, and particularly, its west coast. That’s not to say that Vancouver and area don’t get their share of wind off the Strait of Georgia; look what happened in late 2006 and early 2007 in Stanley Park – they’re still cleaning it up. But I remember that night in December 2006 in Sooke. I was lying in bed, unable to sleep, especially after the power went out and the only sound I could hear was the wild wind (which topped 140 km/h in some areas of Sooke) blowing down trees and ripping shingles off my roof. I was lucky, I lost a few shingles. 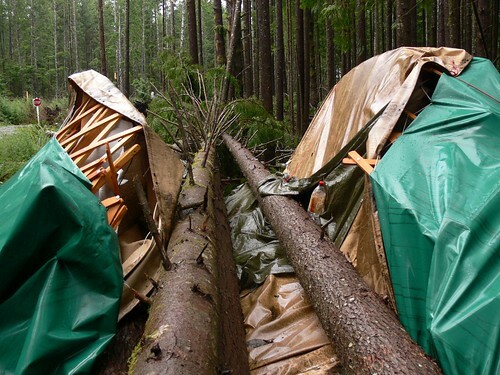 Others weren’t so fortunate; at least 3 families lost their homes after huge fir trees blew on top of them. The Glenidle By The Sea condo complex lost part of its roof. I awoke to what looked like a disaster zone. Trees down everywhere. Power, phone, cable, you name it – if it came to Sooke via wire, it was down. – Get a generator. You will probably lose your power at some point this winter. Usually it’s not long, but some areas of Sooke were without power (and for many on wells with an electric pump, water) for over a week in that storm. I have several clients that have an integrated natural gas-fired generator that will power the whole house. Expensive? yes, but a simple gas generator that will enable you to see at night won’t break the bank. – Along the same lines: Have a non-electric source of cooking. One thing that sticks in my mind about the morning after that storm is the lack of caffeinated glory that comes from my morning coffee. Without power I was unable to feed the addiction. I could have boiled water on the barbeque, I guess, but what good would that be when my coffee is in bean form and my grinder is electric? I’m not proud to admit it, but I was considering grinding beans by hand hammer and/or eating them. Nowhere in Sooke was open for coffee and the road was blocked by many trees. I now keep a small container of ground coffee in the freezer for emergencies. – Most homes in Sooke have some sort of fireplace – be it gas or wood-burning, but it will come in handy in the storms. I spent much of the day huddled close to the gas fireplace (it works better with electricity to power the blower) with my freezing dog. Stock up on wood or fill the propane tank if you’re not on natural gas. – Have basic repair supplies and equipment on hand. I mentioned I lost some shingles. Unfortunately, I didn’t have any replacements and our otherwise extremely well-stocked Home Hardware didn’t carry the type of shingles I needed. Tarps, rope, plywood, plastic sheeting would all be handy for emergency repairs. A chainsaw would been useful too. – Pitch in and help your neighbours. This is key; We’re all in this together. The strength of a community truly comes out in times of trouble. Got a chainsaw? Go clear the roads and driveways (bonus: free firewood!). Spare room or two? Help somebody whose home has been damaged. Or give a cup of coffee to a caffeine-starved REALTOR/blogger. You get the idea – can’t watch TV or blog, so you might as well get out there and pitch in. What about you? What are your tips for fellow readers to survive the winter windstorms?